Ordinary Goodness: Pay attention, look for light. Pay attention, look for light. My dad had a dream about his father the other night and remembered it. Which is weird because my dad hasn't remembered a dream in years. He chuckles, describes it like real life, his father striding in with a joke. His (my) (grand)father died two months ago, and I am still muddled by it. Waiting for my own dream to glimpse him again, clear. Three of the five light bulbs in my bedroom have died in recent weeks. Each time, I heard the pop and sputter when the bulb went dry with darkness. Each time, I have walked away, ignoring the hall closet that holds fresh lights. Part of it is laziness, but part of it is active, waiting for the others to fizzle, fade. Cleansing journey from deepest dark to bright. Today I had to say no to something that I really wanted to do. You hear all the time that we're too busy, we say "yes" too much. But this was a "yes" that would have been life-giving good, and calm. It's hard to count your days, to stagnate, hold back my heart's yes. Chained to the calendar, sometimes I want to break. I watched Olympic ice dancing, woke up with strings and "Swan Lake" in my ears. Dark and resonant, it followed me through breakfast, NPR, brushing teeth. Then for no reason, driving in the car, in the first minutes of work, it shifted. Just words and a tune, pulled from a brain file or a heart need, childhood origin. Muddled, sputtering, chained, suddenly I was humming light. When my great uncle passed a year ago, they offered his plants to family. 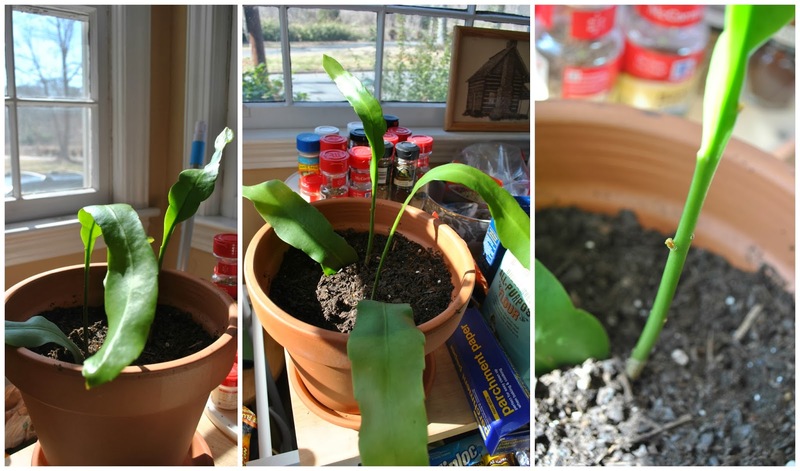 He tended night blooming cereus, and two received new life in our kitchen. They grow in a clay pot on the island, we water, unfurl the window shade for sun. Shiny-green, mottled soil, crammed against the spice rack; they mostly stay the same.